Brooklyn & Boyle | Art and Life in Boyle Heights : Brooklyn & Boyle Celebrates Mom! Brooklyn & Boyle Celebrates Mom! 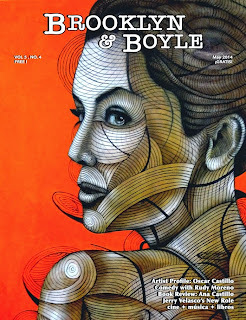 Brooklyn & Boyle is proud to once again offer an original work of art on the cover. Our next issue, due out next week (May 21st), features a painting by Ricardo Garcia entitled Sunset. An acrylic on canvas, the piece was selected because it evokes the hard working moms who have raised us while holding it down both in and outside the home. If it wasn't for them, we wouldn't be here,and we would definitely have an appreciation for beauty and art. Our next issue will also once again include a question-and-answer piece by El Art Pocho, who spoke to photographer Oscar Castillo, an artist who is considered one of the preeminent Chicano lensmen in the nation. Senior Contributing Editor Thomas Varela, offers an intimate look at funnyman Rudy Moreno, who packs them into the Pasadena Ice House every week. Founding editor Abel Salas reviews Give It To Me, a new novel by Ana Castillo, a writer of extraordinary prowess and world-wide acclaim. In addition, readers will once again have the opportunity to "Ask a Wise Latina" questions about life, love and the pursuit of inner peace and happiness. And these are just a few of the things you'll find in the newest edition of Brooklyn & Boyle. A limited amount of advertising space is still available on a first-come, first-serve basis. Team member Natily Gonzalez, a hard-working mother herself, is standing by to work with your staff to help boost your business with a strategic advertising and marketing plan. Your partnership means a great deal since it allows us to continue supporting cultural arts and education on the East Side through positive profiles, art reviews, interviews with educators, musicians, writers, playwrights, dancers, painters and sculptors as a way to showcase the talent and beauty within our communities on the Greater East Side. Don't forget to come out and join us at the annual Sacred Heart Fiesta in Lincoln Heights this weekend for free music, food, fun and games for the entire family.